Turn your face in any direction, someone is always trying to spy on you; doesn’t matter who and what you are? Just yesterday we reported that Communications Security Establishment Canada (CSEC) in Canada and NSA are together, running a spying program called 'game-changer'. It was revealed that the agencies are tracking all the travelers who passed through the airport terminal, and could be tracked throughout the country by referencing it with the intercepted information from Wi-Fi in cafes, libraries and other public places. 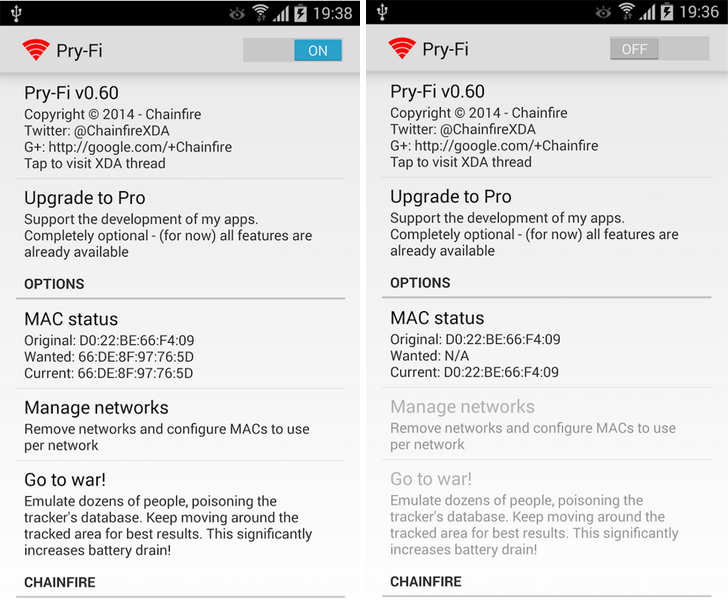 Today XDA Senior Recognized Developer 'Chainfire' has released a new Android app called Pry-Fi, that allow a user to disable Wi-Fi completely, including the background network scanning. Pry-Fi will prevent your device from announcing all the networks it knows to the outside world, but it will still allow background scanning and automatically connecting to Wi-Fi networks. 'Retailers, crooks, the government, and others shady individuals are tracking your movements. Even when your Wi-Fi is turned off, your phone may be broadcasting information to whomever is in range which can be used both to track repeated visits to as well as your exact movements in an area under surveillance.' he said in a post on Google plus. According to the expert, the latest versions of Android OS keep on broadcasting MAC address of the Smartphone you are using; doesn’t matter whether the Wi-Fi is turned ON or OFF. Disable Wi-Fi completely: The app will completely disable Wi-Fi and all related services that automatically broadcast device information silently in the background. Random MAC address: While you are not connected to a Wi-Fi network, the app will constantly assign a new random MAC address to the device. This feature will slowly poison the tracking database of spying agencies with useless information. War mode: Pry-Fi comes with a War mode, which when enabled tries to make your Android device appear like dozens of people. Just wandering around an area under Wi-Fi location surveillance for a few minutes can ruin the tracking data for the period of your stay. This application is available on Google Play for free download, but this app will only work on rooted android devices.